Infrastructure provisioning was once a major bottleneck to the progress of digital initiatives and new application deployments. But with the advent of converged and hyper-converged systems, that bottleneck has been removed. When you’re making the case for CI/HCI, on which benefits can you hinge your argument? Just ask your peers. 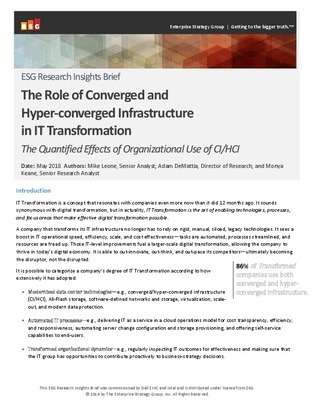 This ESG research report from Dell EMC and Intel® details the quantified benefits of using CI/HCI in your organization, validated by a survey of 4,000 IT executives. Read on to see how your colleagues responded to questions around OpEx savings, time spent on systems management, and more.